Misty. It's not really blood, she's just been licking the red salt-lick. Siganus Sutor, our correspondent in the Indian Ocean, has started a blog — you can look at it here and it’s in the blogroll — it’s about the French language as it is used in Mauritius. It lists all sorts of words and expressions that are used there; some come via English or from India, but they’re French. It is really interesting and fun to read. A person is said to have a goat’s mouth when he/she wishes another evil, and the wishes are fulfilled. It also applies to one who has the foresight to discern impending danger and forewarn those concerned. 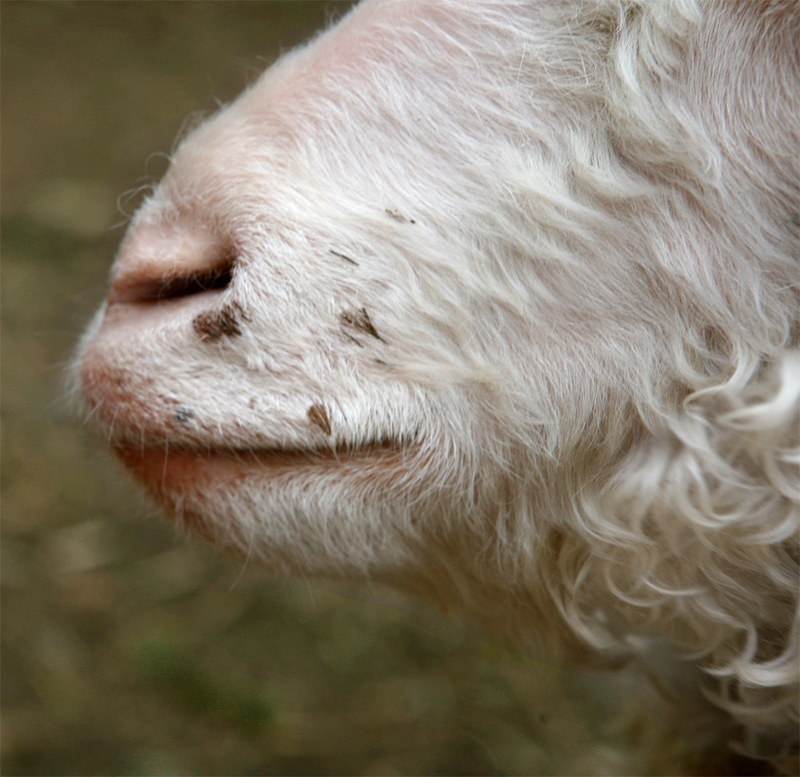 In either case, one is likely to say “‘im ‘av’ goat mout’,” or “‘im put’im goat mout ‘pon” whoever suffers. One can only hope that Norwegian goats never learn the tricks from their faraway cousins. Actually it’s a really interesting blog that makes you want to head immediately for the Caribbean, but that’s another story. I want to know why this expression, ‘goat mouth’ — la bouch cabri — appears in two different languages off the coast of two different continents. Did it originate in Africa? If anyone can explain it, please post a comment. I want to know why this expression, ‘goat mouth’ — la bouche cabri — appears in two different languages off the coast of two different continents? Did it originate in Africa? If anyone can explain it, please post a comment. Maybe if you give the keyboard to Misty she will post a comment here. Goats that predict undesirable events in French (or in French-based Creole) are not limited to Mauritius only. You find them throughout the Mascarene Islands and maybe in the Seychelles too. (I’ll try to check for the Seychelles, which were part of Mauritius until the beginning of the twentieth century.) For Africa, I really don’t know what goats do there, except climbing trees in the North of the continent. Oops! what happened to me? Qui suis-je? Où vais-je? Dans quel état j’erre? The Mascarene Islands (or Mascarenhas Archipelago) is a group of islands in the Indian Ocean east of Madagascar comprising Mauritius, Réunion, Rodrigues, Cargados Carajos shoals, plus the former islands of the Saya de Malha, Nazareth and Soudan banks. The collective title is derived from the Portuguese navigator Pedro Mascarenhas, who first visited them in 1512. These were once volcanic islands, much like Mauritius and Réunion, which have now sunk or eroded to below sea level or, in the case of the Cargados Carajos, to low coral islands. The Saya de Malha Bank formed 35 million years ago, and the Nazareth Bank and the Cargados Carajos shoals after that. Limestone banks found on the plateau are the remnants of coral reefs, indicating that the plateau was a succession of islands. Some of the banks may have been islands as recently as 18,000 – 6,000 years ago, when sea levels were as much as 130 meters lower during the most recent ice age. The sea rose 130 metres? Metres? That’s 426 feet! I had the figure of 120 metres in mind, but why not 130. The (English) Channel was an enormous river collecting waters from the Thames, the Rhine and the Seine. The volcanic islands we have off the north coast were attached to a much bigger Mauritius. If one manages to dive deep enough, he would be able to see old cliffs that existed in the past and which are now dozens of metres under the surface of the sea. But I didn’t know that the Banks (mainly Nazareth and Saya de Mahla) were islands. Actually we lost more than the Chagos and Tromelin. It’s here in a much older Étude sur le patois créole mauricien. Well, everything worked but the “small” tag; I’ll take it! Goodness, from 1880. I wonder if Siganus knows that one. M., in those Google book searches there’s no way to actually read the text is there? It’s like the JStor things, I can’t read those either, because I’m not affiliated with an institution or a member of an English-language library. Yes, Noetica’s requested a comment preview too. I’m trying to find one, without any luck — yet. goat-mouth bite you (StVn) (i) You seem to be bewitched, or always unlucky; you never seem to know what you are about. [Perh a calque. Cp Yoruba ewurẹ bu u jẹ (goat bite him) ‘he is impotent’] (ii) [By extension] [Of a young woman] You seem unable to get married. But there’s no explanation of why it’s also used in Mauritius and the adjacent islands, in French, but (as far as I know) nowhere else. I’ll get that book. I can’t say I need it, but it sounds fun. Although the Caribbean /Mauritius version is somehow both more useful and vaguer (and, to me, more colourful and interesting as a metaphor) than the Yoruba saying, and I wonder if it really comes from there. By the way, for anyone who has time, that blog from Trinidad, Small Island Girl, is really well-written and interesting to read although she hasn’t posted anything for a while now. There are some interesting local dialect words she uses, such as ‘upseen’ for ‘obscene’. I don’t think you can get comment preview with a free blog, but you can check the forums. Maybe if they get enough inquiries they’ll add it. Noetica thinks it’s way too small a box, too. Yeah, over two years is a while. Hope she’s doing better; that last post sounded a little down. Anyway, I wouldn’t call “upseen” a dialect word so much as a creative spelling. Here in the U.S. we talk about “self-fulfilling prophecy” but we don’t attribute it to any animal. It’s also bad luck to predict something bad, and then we say “knock on wood” so it doesn’t happen. It probably did come from Africa. I remember once looking up some stuff about zombies and finding out the word for “soul” in Haiti–something like “baka”–had Egyptian counterparts “ba” and “ka”. The “ka” IIRC is the part of the soul that lingers around the possessions of the deceased for some years following their death. Tsk, tsk, looking a gift horse in the mouth. I saw this comment from Sig on LH yesterday and remember thinking that’ s exactly the kind of thing Sig should post on his own blog. But it’s still kind of under construction. Yes, I know it. I even have it in front of me right now, in the original edition. That’s one of the things my father left me. MMcM, is there a way to download it in PDF? I am able to download it as PDF, which means I am somewhat limited in being able to suggest how you can get around Google Book’s silliness. These fully out of copyright works usually get copied to the Internet Archive. This one is here. The download link it shows you on that page is Google’s, but click through to the HTTP directory listing and maybe there’s one there that’s accessible to you. It isn’t in Gallica or OpenLibrary, though another of the author’s works is. If that doesn’t work, the next step would be a proxy, for which the details are always changing. Thanks, M. That looks very helpful. MMcM, I had already tried this page some time ago, but when I right-click on the PDF link it tries to download an HTML file instead. It doesn’t work for me. Bah, I already have the original book, so why should I wonder? But it’s always handy to have it as a PDF, out of which one can easily extract a page for instance. Email, sure. Just send me an address that can receive a 4MB attachment. I love this expression and will try to use it at least once a day. Yes, I love it too. Does anyone know how that Caribbean accent — it sounds a bit Geordie (very far N.E. England) and a bit Welsh to me — how it came to be that way? Apparently Gmail can now take 20 MB attachments. The comment about “goat’s mouth” along with the link to the Caribbean blog–I thought it was on LH, but maybe it was here. I’m very stressed out today. I just turned in my grades, but now I seem be in the middle of a gang war. The police left a few hours ago. I always did want to live in interesting times. The reason I came back to this thread was I wanted to ask about the salt lick. Why do goats want salt and why red? The cows where I grew up had salt licks too, but they were white. Let me guess, red salt comes from the Red Sea? I was sad to see Sig has switched to French, although he still has some English, as well as something Google identifies as “Serbian” in his introductions. I suppose if I want to comment now, I shall have to use Google Translate. I do wish he would do a podcast of the swear words. Serbian? He did say he had a Hungarian uncle. Actually, I think Sig speaks a Slavonic language. Hmm. I’ll have to ask my daughter, she knows about that sort of thing. an mo ti tipti, enn lane mo ti ena enn professer franse ki ti enn franse. Li ti kontan fer lalist bann “mauricianismes” ki li ti tourve dan nou devoir. Sakenn ti bizin lir so bann prop “mauricianismes” divan tou dimunn. Sa ti fer li riye terib — nou nou pa ti pe konpran kifer. Cannes you can tipti, enn lane as you can professer France enn ki ti enn France. I kontan fair lalist bann “mauricianismes” I tourve to the day Noah devoir. Sakenn you bizin lir with bann prescribed “mauricianismes” wonderful tou dimunn. With the fair you riye terib – Noah Noah and the pe konpran Kifer. Seems like a lot missing. I’m glad he did the blog though. When I first delurked at LH, I didn’t know what to think of him. The blog shows his serious side, and the pictures of the animals and snails and art he sends to people make me think he would be fun to sit and have coffee with at some beachside cafe . That’s creole, he says so in the comments, here. Heaven knows what it means. We should hold the first LH meeting at a beachside cafe in Mauritius. Kan mo ti tipti, enn lane mo ti ena enn professer franse ki ti enn franse. Li ti kontan fer lalist bann “mauricianismes” ki li ti tourve dan nou devoir. Sakenn ti bizin lir so bann prop “mauricianismes” divan tou dimunn. Sa ti fer li riye terib — nou nou pa ti pe konpran kifer. When I was small, one year I had a French teacher who was a Frenchman. He liked to make lists of the mauricianisms he found in our exercises. Each one of us had to read his own mauricianisms in front of everybody. It made him laugh a lot — we didn’t understand why. Well, now maybe I start to understand why. I bet you didn’t know this was the same in Serbian, Sig. No, no, I knew it, except for the fact that it was from the southern dependencies of Serbia, where they speak a specific dialect. That’s done, and I can confirm that in Seychelles too they have “la bouche cabri”. It’s almost as if everyone says this except the Europeans, then. We’ll have to ask Stuart and Noetica if they say it. They will once they know about it. Hey, I never wanted to post the above comment. This is an abuse of power. Even an abuse of human and caprine rights. (Thanks by the way. The only thing now is that Language Hat will think that I “travaille du chapeau*” since I seem to be saying that I didn’t post his comment. * Travailler du chapeau: to be delirious, to be mad. Now why is travailler du chapeau ‘to be delirious’? Probably because once your hat starts “working” on your brain, it wreaks havoc with it. I’m guessing you mean Herr Grumbly Stu, because I’ve never heard of this expression, or any even close. Sorry. There is an expression here in Wobegon, maybe old by now, “keep it under your hat”, meaning keep it secret.